The first thing that you will notice from the map above is that the starting point of all routes to Machu Picchu is the city of Cusco, the historic capital of the Incas located about 120km to the south-east of Machu Picchu. Cusco is a beautiful and fascinating city and the perfect place to base yourself for a few days. The second thing you'll notice is that there are no direct roads between Cusco and Machu Picchu. There's a good paved road from Cusco to Ollantaytambo which is in the Sacred Valley but the river valley between Ollantaytambo and Aguas Calientes (the town nearest to Machu Picchu) is so narrow and winding that there is only just enough room for a single line railway which hugs the edge of the fast flowing River Vilcanota and passes through several tunnels (it is prohibited to walk along the railway track for obvious reasons). Therefore unless you plan to trek to Machu Picchu via the Inca Trail then you will end up taking a combination of bus and train to Aguas Calientes and then take the short bus ride from Aguas Calientes up to the ruins at Machu Picchu. Visiting Machu Picchu by using a combination of bus and train from Cusco is, by far, the most popular method of transport. Around 80% of visitors use this method (60% taking the train from Ollantaytambo and 20% taking the train from Poroy, a station located just outside Cusco). Take a bus or taxi from Cusco to Ollantaytambo Station in the Sacred Valley. 2 hours > Travel by train from Ollantaytambo to Aguas Calientes. 1 hour 30 minutes > Take the shuttle bus from Aguas Calientes up to the ruins of Machu Picchu. 25 minutes > Visit Machu Picchu > Return to Cusco by the same route. Take a bus or taxi from Cusco to Poroy Station. 20 minutes > Travel by train from Poroy to Aguas Calientes. 3 hours 15 minutes > Take the shuttle bus from Aguas Calientes up to the ruins of Machu Picchu. 25 minutes > Visit Machu Picchu > Return to Cusco by the same route. If you plan to organize a trip to Machu Picchu yourself without buying a ready-made package from a tour operator then you will need to break down the booking process into its separate stages and tackle them one at a time. 5. Entrance tickets to Machu Picchu - decide what type of entrance ticket you want - If you want just the standard Machu Picchu Only tickets we would recommend booking at least 3 days in advance during the high season. It is possible that they may sell out quicker so why risk waiting until you arrive in Cusco. We would recommend booking at least a few weeks in advance to avoid any problems. During the low season it may still be possible to buy your entrance tickets the day before you visit Machu Picchu. But, again, why risk waiting. If you want to buy the Machu Picchu & Huayna Picchu combo ticket then you should really try to buy this ticket several months in advance to avoid disappointment. ALL of the treks to Machu Picchu below have to be booked through a tour operator. You cannot organize these treks on your own. The tour operator will therefore make all the arrangements to buy your trek permit (required for the Classic Inca Trail and the Short Inca Trail), your entrance tickets to Machu Picchu and your transport back to Cusco after the trek. The only thing you need to do is decide which trek you want to do, research a suitable tour operator and book your trek. Everything else is taken care of. 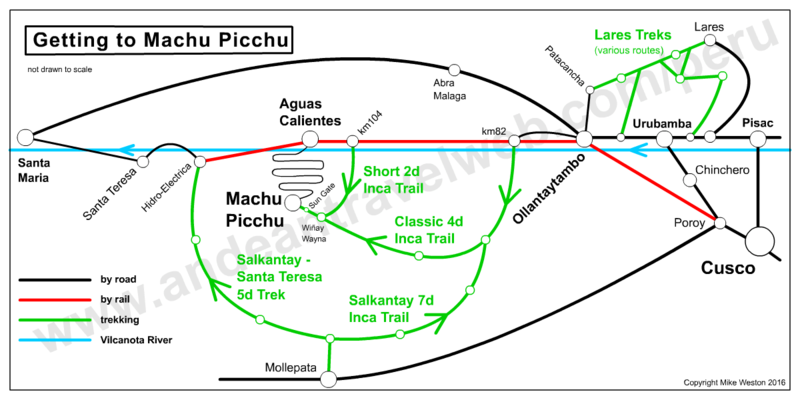 Option 1: Classic Inca Trail to Machu Picchu* (4 days). Taking a bus from Cusco to the start of the trek at km82 (about 6 km beyond Ollantaytambo) > trekking from km82 to Machu Picchu (3 nights camping) > Visit Machu Picchu > Take the shuttle bus from Machu Picchu to Aguas Calientes > Travel by train from Aguas Calientes to Ollantaytambo Station > Take a bus from Ollantaytambo back to Cusco. Taking a bus from Cusco to Ollantaytambo station > Travel by train Ollantaytambo to km104 > Trekking to Machu Picchu (you usually don't get the chance to visit Machu Picchu on this day) > Take the shuttle bus from Machu Picchu to Aguas Calientes (1 night in hotel in Aguas Calientes) > Take the shuttle bus to Machu Picchu > Visit Machu Picchu > Take the shuttle bus from Machu Picchu to Aguas Calientes > Travel by train from Aguas Calientes to Ollantaytambo Station > Take a bus from Ollantaytambo back to Cusco. This is a long, tiring and potentially dangerous bus ride from Cusco to Santa Maria via Santa Teresa and then either continuing by foot to Aguas Calientes or taking the train from Hidro-Electrica. This journey is hardly worth considering unless (a) you are really really counting your pennies (b) you decide to mountain bike down much of the down hill section of road between Abra de Malaga and Santa Maria which is quite spectacular but still quite possible you will meet face to face with a large truck on the wrong side of the road during any of the numerous hairpin bends along the route (c) all Peru Rail train tickets have sold out and this really is your last hope of seeing Machu Picchu. There are a number of travel agents in Cusco advertising Machu Picchu by private car - it's this route they are referring to. Good luck.